Smart Desk is run by Sarah Jones and is based in South Wales (in the UK). Some people call me a virtual assistant, I call myself a freelance administrator. 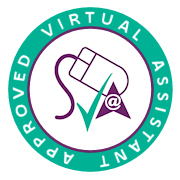 I am an approved member of the Society of Virtual Assistants. I usually work remotely but can work from your office if you prefer. Before working with you I like to meet, although that is not essential. Following our initial discussion I will provide you with my terms of business so you know what you can expect from me. With many clients I use Dropbox or Google Drive to share files safely and use email, telephone and Skype to keep in contact. Trust is extremely important to me. I fully respect the confidentiality of my clients and will treat all of your material, financial and commercial information in strictest confidence. I take appropriate and proportionate steps to secure data. Electronic files are backed up remotely using a third party IT company and electronic devices are password protected. I am covered by professional indemnity and public liability insurances. I understand that as a freelancer or small business you don’t want to be tied in to employment contracts or paying for a member of staff when you don’t need them. Smart Desk prides itself on providing flexible administrative support. I am happy to work on one-off, ad-hoc and regular pieces of work. Some clients ask me to work for them for a set number of hours per week/month, while some just contact me when they need me. I do not require a minimum commitment from clients, there are no contracts and no notice period is required to terminate our working relationship. Please note that monthly packages are payable by Direct Debit. I have worked in the public sector for over 12 years as a project manager, office manager and trainer. To view my full CV go to LinkedIn, feel free to connect with me there. I occasionally work with associates on larger projects. Please feel free to contact me to discuss your admin needs.